Back in 2014, Emily King negotiated loving her partner without losing her sense of freedom on the single “Distance”. Of distance, she crooned, “It makes me want to clear my head / Find a little gap there and write the words to a song”. Since that time, if “Scenery” is any indication, King has done a lot of productive head-clearing and songwriting. 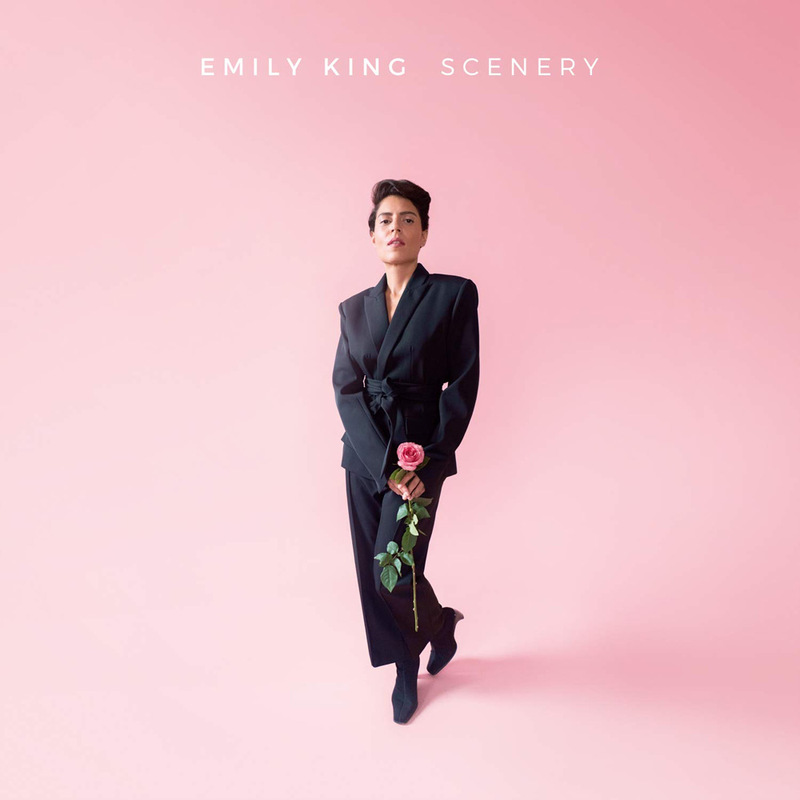 “Scenery”, King’s third album, stands as a perceptible sonic departure from the R&B crooner’s two previous LPs, not because she abandons the conventions of the R&B, but because she convincingly fuses them with synth-driven pop. The departure isn’t merely sonic, though. King’s lyrics build to a compelling thematic vision of the self that champions self-exploration and discovery, which seems like the logical conclusion of her single “Distance”. As such, King’s new album reflects self-awareness, maturity, and experimentation. She’s also managed to pack “Scenery” full of certified synthy bangers. King first announced her intention to meld R&B with synth-pop back in October, when she released the album’s lead single “Remind Me”. While the song begins slowly, led mostly by a quick strumming guitar, it quickly flourishes into a poppy piece of 80s pastiche with a quick-grooving baseline and a jagged thudding synth. She sings, in a voice like vapor, that she is reminded of “Something that I used to feel / Like a heartbeat racing / Like a new beginning”. King’s lyrics here cleverly introduce the album: they manage to comment on King’s own new sound, while also telling an abstract story of love. But, for King’s latest release, even love seems mostly like a springboard for self-exploration. The partner in “Remind Me” doesn’t fulfill her desire for “something”, but rather reminds her that she’s capable of feeling some inchoate, existential desire. Another single, the sultry “Can’t Hold Me”, features an exotically tuned guitar and hand drums accompanied by a prominent, funky base and gauzy synths. Again the lyrics are cleverly ambiguous. In the chorus, King croons, “You can’t hold me down / Only I can do that”. The line takes on multiple meanings: does she mean her lover’s inferior in offering support and loyalty and that only she can do that, or that he couldn’t dream of dragging her down? In either sense, King is the prime agent, while the lover is a mere foil. These lyrics also reflect a personal, subtle take on the intricacies of love and heartbreak. On the standout “Forgiveness”, King laments how she acts in front of a love interest: “You make me beg for forgiveness / I just can’t stay in your presence / without making bad decisions”. As the synth throbs like a heartbeat and the guitar mournfully ascends, the listener feels the seductive and melancholic power of this partner. Still, the song focuses on King’s own self-defeating response to him. It’s heartrending, understandable, and totally compelling. And King seems to know this. She convincingly plays an unreliable, scorned lover on “Look At Me Now”, a track that was also released as a single and rides the bounces of the snappy drums and groovy bass. In the song, King boasts to an unnamed ex, singing “Look at me now”, before begging, “Oh, baby, please look at me now”. She ends the song with more clever ambiguity. She entreats her ex to say anything to her, while also alluding to a new beginning without him: “Hello”, she says, as her voice floats into the ether. Although King’s lyrics seem to lead to abstraction, her music never fails to feel fun, in part because her synth-soaked tracks keep a welcome sense of self-awareness. The piano on “Teach You” skips along and guitars gently strum in what, thanks to the thumping, snappy drums, sounds like a modern homage to 50s doo-wop. She sings, “It’s never too late to learn the way”. The track “Interlude (What Love Is)” is a pared-down acoustic ballad, before it’s overlaid with nostalgic, out of tune synths that hover over the melody. Producer Jeremy Most plays with similarly distorted sounds on “Blue Lights”, on which phonographic violins intermittently join the melody. This use of pastiche seems to reflect King’s own self-awareness about the difficulty of foraging new personal territory. On “Interlude (What Love Is)”, the nostalgic synths fade into the sky, but their mere use betrays a desire to stay connected to a past she’s already idealized. “Scenery” has one lone misstep: “2nd Guess”. The track is largely bare, led by two interplaying guitars and the occasional twinkling synth. Naturally, the song emphasizes her voice and lyrics. While her voice doesn’t disappoint (I’m not sure it’s capable of disappointment), her lyrics do: “I know it sounds crazy / I know we just met / Life is always better when there’s no regrets” and “I can make you happy / Never ever sad” feel especially cliched because the rest of the album’s writing is so fresh and inventive. On the whole, “Scenery” is a fantastic album, sonically, lyrically, and thematically. On the final track, “Go Back”, a throbbing reprise with a steady, infectious synth, King sings “I know there’s something waiting down this road ahead / I’ll find it in the end”. While the territory is uncharted, King affirms her decision to travel into it: “I’ll never go back / You’ll never change that”. Whether she’s exploring new sounds, new ways of describing old feelings, or new anxieties about new feelings, Emily King proves a worthy voyager.